Most of the specialty items in my kitchen come from the clearance aisle or as the result of a determined hunt, armed with coupons. Pink silicone heart pan? Week after Valentine's Day. Nordicware mini bundts that make 3-D pumpkins? Just after Halloween. So what do you think happened when I ran across this item at Target, labeled "This Just In!" I would have bought it even if we weren't planning another dinosaur birthday party this year. (Sorry, Shellyfish, I don't know if they're available in France!) 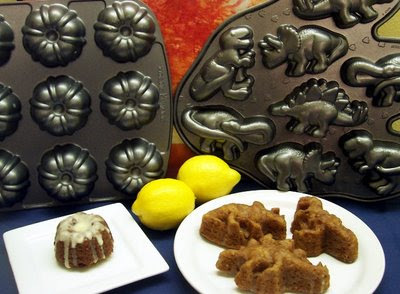 First I tried making nice, healthy muffins in the muffin pan, but the coarse texture damaged the dino detail. Sift flour, baking soda, and salt together into a medium bowl. Grate the lemon directly into the flour mixture and stir, then juice the lemon and pour the juice into a measuring cup. Add orange juice to measuring cup until mixture equals one cup total. Combine juice, oil, sugar, and poppy seeds if desired and stir until completely integrated. 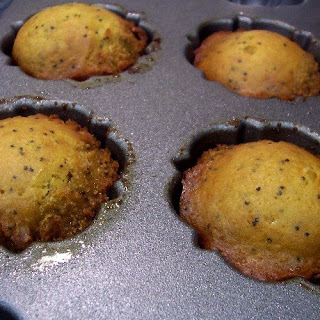 Fill muffin openings no more than three quarters full. I gave the filled pan a couple of good whacks to get rid of any air bubbles. Since almost half of my batter was left after filling the dino pan, I added 1 1/2 tsp poppy seeds to the remaining batter, prepped my mini bundt pan, and filled half of its openings, as well. Bake for 20-25 minutes until nicely brown and the sides have pulled away from the edges. (You can do the thing with the toothpick, too.) Allow to cool 5-10 minutes in the pan, then place a cooling rack on the top of the pan and gently turn it upside down to release the cupcakes. This glaze is amazingly easy: sift powdered sugar into a bowl and stir in orange juice. The only decision is how thick you want the glaze to be. 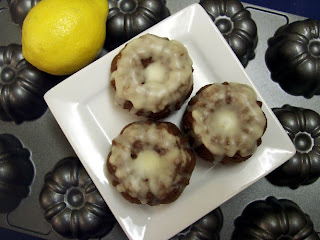 For the bundts, I added just enough orange juice to make the glaze drizzle-able. You can see how thick it is on them. Since I didn't want to hide the detail on the dinosaurs, I added additional orange juice to the glaze before covering the dinos. At first I had a terrible time drizzling it onto the cupcakes with a spoon and trying to cover the entire area. Then I remembered that I owned a pastry brush, and finished them up quite easily. 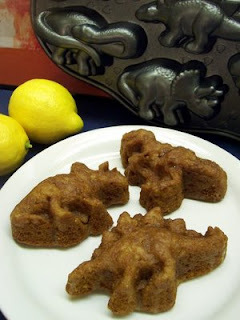 The thin glaze doesn't look very fancy giving the dinos just a little shine, but the juice soaks into the cupcake, leaving it wonderfully moist and flavorful, almost like a nonalcoholic rum cake. 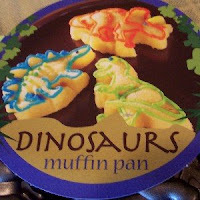 I am sending my lovely dinosaurs and mini bundts to Joelen's Culinary Adventures for her Tasty Tools Muffin Pan event. Be sure to check out her round up! Those are too cute! And the glaze, yum! Of COURSE you had to buy the pan. That is a no brainer. Those are sooo awesome! I might just have to go get one too! Today when asked what he wants to be when he grows up, my son said, "a dinasaur"
Love these cakes, no matter what shape or size!